Jenna , good to know ‘not daphne’ had a cute kitten. Touching story. 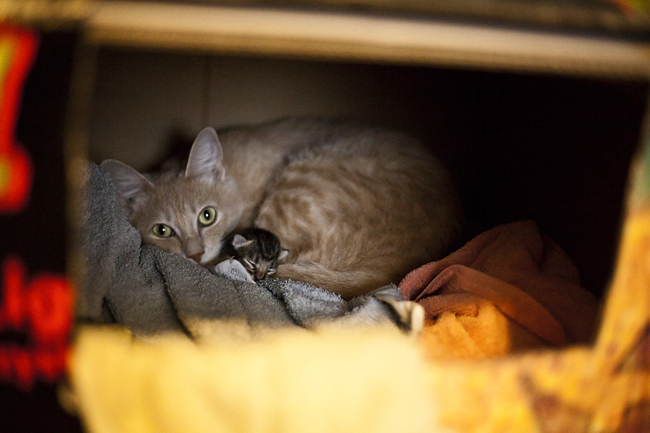 Boots and her kitten are lucky you came along. I can’t wait to meet them and see the pics. What did Boots do to not allow M to leave? Did she meow a lot? So, if you just walked in and wanted to adopt Boots, the SPCA wouldn’t have let you? Was it because she was so sick? I still haven’t been able to take more than a few. I can’t wait till she’s running around more. 🙂 Boots was actually taking M’s hand with her claws and hugging it. She’d hug it harder during her contractions. She was also panicking (crying really fast and panting) and trying to get out of the box whenever M would try to leave. The SPCA was so stupid. They wouldn’t let us take her because she didn’t have spay markings and Daphne was spayed, but we’d called our vet and the vet said they do a new technique that doesn’t leave spay markings. We kept asking why we couldn’t just adopt her then, but the receptionist was being really rude about it. If we’d come in and asked to adopt her it would have been fine, but since we thought she was our cat, they wouldn’t let us. That’s why we had to cause such a stink. I’m glad we were able to take her home eventually. I don’t know why they didn’t catch that she was sick while she was there, but I’m glad they didn’t because they probably would have just put her down. I’m so sorry about your cats. It’s hard when you don’t know and there isn’t closure. I hope they are with a wonderful family with lots of little kids who love to snuggle.